Ceri Smith; photo provided by Ceri Smith. Very exciting news to share: the talented Ceri Smith of ~BIONDIVINO~ is going to be the wine director at ~TOSCA CAFE~, working with Ken Friedman and April Bloomfield on the revamp of our locally beloved icon. Details are still in their nascent stage, so expect more about what the focus is going to be and other exciting components of the wine program in coming weeks. Smith affirms that Biondivino will continue to stay open and be her baby, but she will be full time on the floor at Tosca, which is due to open in October. Cin cin! 242 Columbus Ave. at Broadway. 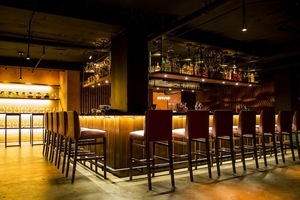 The bar at Roka Akor. Photo by Aubrie Pick. Last week as I was leaving for Seattle, I got a tip that Daniel Hyatt was leaving his bar manager post at ~ROKA AKOR~. No need for me to follow up with him, because Eater has confirmed he has left the project—seems it wasn’t the best fit with what the crowd there wants (er, cosmos?). For now, he’s taking a break—although you can peek at our Labor Day post in the chatterbox, where you’ll find a few of his drinks (in the meantime). 801 Montgomery St. at Pacific. Since we’re on bar manager news, Carlos Yturria has been brought on by Franck LeClerc to manage the bar programs at the upcoming Gaspar, as well as Gitane, Café Claude (both locations), and Claudine; he was most recently at E&O Kitchen (via Scoop). The entries at last year’s Sunday Bloody Sunday. Photo © Jonathan Fong via Facebook. 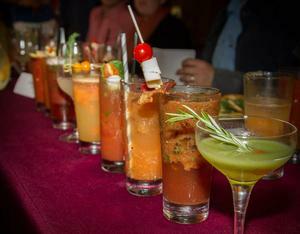 Get ready for the third annual Sunday Bloody Sunday Bloody Mary contest at ~SCALA’S BISTRO~ on Sunday September 8th. The event features bartenders from 10 different bars around town shaking up their best Bloody Marys. Participants include Big and Novela, and this year the theme is “anything but vodka,” so look out for Bloodys made with tequila, rum, gin, and whiskey. Scala’s chef Larry Finn will be offering bite-size samples off the brunch menu, and Almanac beer will be available if you get tired of ‘ole Mary. The event begins at 12pm (11:30am for VIP) and goes until 2pm; tickets are $30 general admission and $40 for VIP.